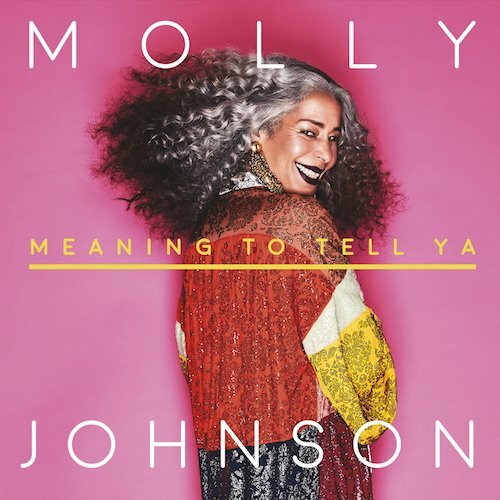 JUNO award-winning singer-songwriter Molly Johnson releases Meaning To Tell Ya today. Working alongside Grammy Award-winning producer Larry Klein (Joni Mitchell, Tracy Chapman), Meaning To Tell Ya marks Molly Johnson’s return to original music. The album features 10 newly recorded songs including seven originals and three interpretations of classic tracks. Drawing from soul, funk, and groove influences, Meaning To Tell Ya is already positioned to be essential listening. Launching the album, Johnson’s take on Leonard Cohen’s brooding “Boogie Street” goes to Canadian radio today. In addition, Johnson will perform songs from the album live to air on Jazz FM on May 14. Known as one of Canada’s greatest voices, she is a mother, singer-songwriter, artist, and philanthropist. Johnson has been awarded the honour of becoming an Officer of Canada (O.C.) and received the Queens Jubilee medal for her philanthropic work. In 2016, she launched the Kensington Market Jazz Festival with over 400 Canadian musicians performing 150+ shows. “Getting to make this record in my home town with my good friends, who happen to be some of Canada’s best musicians, was a dream come true. The result was an album imbued with hope and change. I cannot wait to have it out in the world and share these songs live throughout the summer,” said Molly Johnson. The album was recorded over five days at the Orange Lounge Studio (Toronto) with additional recording at Strange Cargo (Los Angeles). Johnson’s distinct sound and soulful vocals drive the album, giving a quiet and unique feel to each track with backing vocals from Amy Keys and brilliant instrumentals from Davide DiRenzo (drums), Justin Abedin (guitar), Robi Botos (electric piano), Mike Downes (bass), Bob Shepard (tenor sax), Dan Lutz (bass), and Pete Kuzma (organ). Catch Molly Johnson this summer in a string of live performances across Canada in support of the new album. Dates include headlining shows at the Montreal Jazz Festival and the Halifax Jazz Festival. Watch for new dates to be announced soon. Full list of dates below.